As most of you don't know, in my humble little town of Lewistown, where I reside, there teaches a very, uuuuuuhhh, by the book teacher. Whenever a debate between a student and the book arrives, he almost always sided with the book first. Well, until one day, about a year ago, my Junior year of Highschool. Me and two other students were taking the Advanced Placement Computer Science A course, which was simply a not so in-depth course into Java. Well, we were studying either recursion or step loops, I honestly can't remember since both were an equally old, dry topic for all three of us, but there was some other lesson we were supposed to learn about debugging code the hard way by executing it in our heads. I think there was a fancy name for it, but any attempt to remember it is futile. It wasn't long before we started to argue with the book on an individual iteration of the loop (or recursive routine), which was "irrelevant," since the end solution was the same anyway. The details of the algorithem and starting values elude my memory, however, the argument hasn't. This particular iteration involved a division of 10 by the number 2. Now, one would imagin that this is simple math, right? Wrong. Upon arguing that 10/2 is 5, not 8 like the teacher edition says, we ended up arguing for half an hour. Eventually, he realized that he was saying 10/2 is 8, and that this is not a true statement. But, he waited to realize that after becomming angry with us for "wasting class time." Now, less than a week ago, my mind started to wander as we were doing reviews in the Visual Basic 2 (part 2, not version 2) Course, as this was for people who hadn't taken part one in over a year (the district just approved, this year, the teaching of the second half of the book, which informs everyone alot about how technologically advanced my district is). Some of us were also picking on him, again, for his mathematical mistake, and also having our usual talk about hex and assembly verses high level languages. Well, I got to thinking, "What is 10h/2?" To test my theory (as I've come to the inevitable conclusion upon conceiving this idea) I checked my math in Hex mode of the windows calculator (the school district is also very MS friendly), and realized that the book wasn't wrong in saying the result is 8, but wrong in that it did not append an "h" to the original number. Since this wasn't a class that used hex more than chapter one, where it told us that such a notation exists and that magic is needed to use it in Java, hex was the last thing on our four simple minds. Perhaps we may finally stop picking on our poor computer teacher (who, might I add, is one of those HLL advocates who knows very, very little about assembly, not to mention he was one of those teachers that just happened to be available when computers started to be taught in the district, which was when they took ANYONE who was willing to try it). Or, at least we'll stop picking on him for his mathematical ability, since his age and a few other things are still fair game. I was continuing work on the mouse, which was interesting due to being the first device with an IRQ I implemented support for. I worked on general code cleanup as well, split out the old keyboard code, etc. 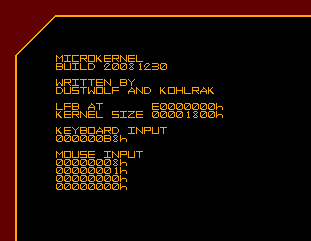 It actually works fine on an actual machine as well, though it only supports PS/2 mice (and not say, touchpads, unfortunately for Kohlrak). Work on this was actually somewhat more fun than frustrating, I only gave up twice durring development. IBM manuals saved me here, they're great albeit written in inverse logic: To understand the basics, you have to read the footnotes and vice-versa. I'm guessing this is a classic case of a manual written for those who already know everything and don't need a manual. As usual there were other docs around, but if you actually read what the IBM docs say some of the stuff was extremelly silly. Can't blame people for not knowing what they're doing I guess, as they prolly reverse-engineered the whole thing from a Linux (which has a big ugly 50 page code hierarchy on mice as usual) or something, but I feel it strange that nobody cared to consider that PS/2 was an IBM thing! Poor IBM. Rearanged the code so that the debugging macros could be used anywhere. Cursing self for making code look like C with codeless header includes (macro includes), but at least it's still tidy (unlike C). Threw out fancy16, because the kernel boots to graphics mode too fast for you to see it anyway. Renamed some files to keep some sense in filenames. Take a look.